Alkemy Companion V2 released ! I am proud to inform you that the Alkemy Companion has been released in its V.2. The last update of the Alkemy Companion was released two years ago. Since then, I needed to update the game data but also the app itself as it was designed for Android 2.x. So for those who know the old version, you can now enjoy a modern Android app. But I didn't upgraded the version number just because of a design update. This new release introduces a new way to manage the game data. You will not have to wait anymore for an app update to see new game data or a fix in those data. The data is managed online so you can always be up to date. Don't worry, the Alkemy Companion didn't turned into an online-only app. For every information you would want to see, the app will first check if it is available on the device and displays it. It will then check for the same information online and update the displayed and stored data. So, make sure your device is online the first time you check some kind of information. Currently, the data is loaded only when the app displays that info. There is no feature that will load it in the background once the device is back online. It may come, but there is currently none. The main audience of Alkemy, the game, is in France as it is a french miniature game. I focused on that audience for this release and I didn't had the time to translate the game data. 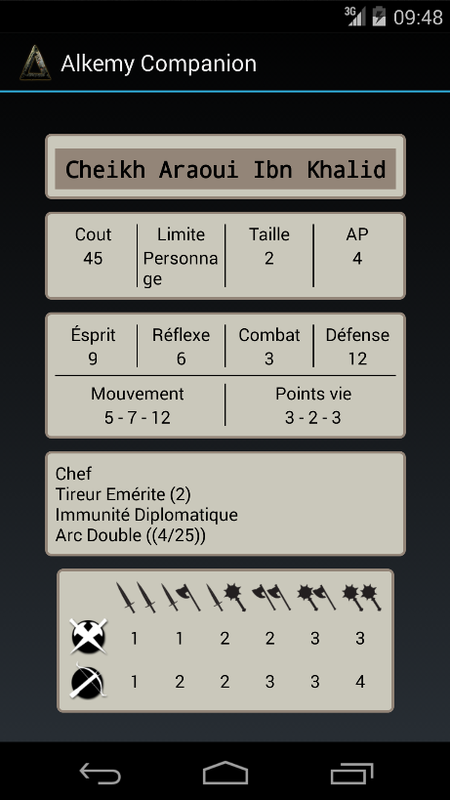 So, rather than leave you all with an old app containing outdated data, I chose to display the data in french for everyone. I will roll out translations in the next... Lets say weeks. That will require an app update. I have tried new things with this release. So the app is not perfect yet. The loading and display data process may not be as efficient as I wanted. I know and I am working on it. But of course, feel free to give me a feedback on anything you think that needs to be improved in the app. I hope you'll enjoy this app. Download it for free from Google Play. Good news for all Alkemy players, after several months in beta, the Alkemy Companion will be released as a 2.0 version next week. As the previous version, the Alkemy Companion gives you access to the profiles, abilities and formulas so you can always check any data you want. This new version is finally designed for a modern Android device. Also, the data is now stored on the Cloud, which allows us to update it without releasing an new app version. The first time you check an information, it is backed-up on your device so if you will be able to check it without a network connexion. Gathering and storing the right information is a lot of work. 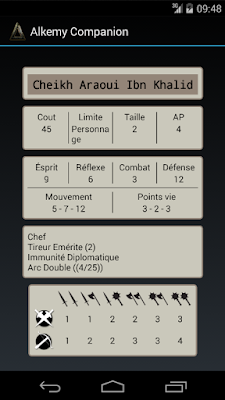 Currently, only the french version of the profiles is available for the 4 first factions and the Temple. I will add the others factions first and then translate them in English. In the meantime, everybody will have access to the french version of the data. So, keep an eye on your updates and follow us on Twitter @big_theapp.